High quality sealed miniature microswitch in industry standard V4 housing. Manufactured by Omron - Part # D2SW-01L3M. IEC IP67 rated (wire lead ). Our REF#1806. Microswitch without lever SPDT 15A/250VAC 0.6A/125VDC IP40. Switch type microswitch. Manufacturer OMRON. Gross weight 6.23 g. Switches features without lever. (at resistance load) at resistance load 15 A / 250 VAC. SteelSeries Kinzu. Better than SILVER ALLOY (D2F series). Logitech All Series (MX, G). Authentic Omron. Made by Omron ElectronicsJAPAN. Switch type microswitch. Mounting THT. Manufacturer OMRON. (at resistance load) at resistance load 0.05 A / 24 VDC. insulation resistance 100MΩ. Button shape square. Button height. 5 pieces set. This microswitch may be compatible with following mouse. - Made by OMRON, 100% New. - Qty: 1Pc. RAZER mouse. We hope you enjoy using our item. It will be more convenient to both you and us. Switch type microswitch. Manufacturer OMRON. Switches features with lever with roller simulation. Lever length 15mm. Leads 300mm leads, on right. MPN D2HW-C232MR. Gross weight 7.79 g.
RAZER All Series. Logitech All Series (MX, G). Made by Omron Electronics JAPAN. compatible with following mouse. Switch type microswitch. Manufacturer OMRON. Switches features with lever. Lever length 20mm. Leads 300mm leads, on right. MPN D2HW-C223MR. Gross weight 7.8 g.
Microswitch with lever with roller simulation SPDT 2A/12VDC. Switch type microswitch. Manufacturer OMRON. Switches features with lever with roller simulation. Lever length 15mm. Leads for soldering. MPN D2HW-C231H. Sealing IP40. Switch type microswitch. Manufacturer OMRON. Gross weight 6.61 g. Switches features without lever. (at resistance load) at resistance load 16 A / 250 VAC. (at resistance load) at resistance load 10 A / 30 VDC. RAZER All Series. Logitech All Series (MX, G). 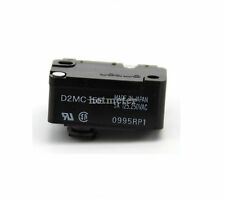 4 PCS 100% Authetic OMRON D2FC-F-7N Micro Switch. compatible with following mouse. Standard V4 size 20 x 10 x 6.5mm. 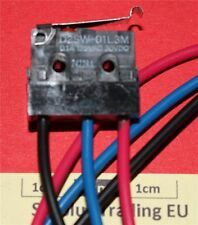 Microswitch without lever SPDT 16A/250VAC 10A/30VDC ON-(ON). Switch type microswitch. Manufacturer OMRON. Gross weight 7.17 g. Switches features without lever. (at resistance load) at resistance load 16 A / 250 VAC. Microswitch without lever SPDT 5A/125VAC ON-(ON) 1-position. Switch type microswitch. Manufacturer OMRON. (at resistance load) at resistance load 5 A / 125 VAC. Switches features without lever. insulation resistance 100MΩ. Microswitch without lever SPDT 0.1A/125VAC 2A/12VDC ON-(ON). Switch type microswitch. Manufacturer OMRON. Switches features without lever. (at resistance load) at resistance load 0.1 A / 125 VAC. Leads for soldering. Switch type microswitch. Mounting THT. Manufacturer OMRON. (at resistance load) at resistance load 0.05 A / 24 VDC. insulation resistance 100MΩ. Button height. 5 pieces set. Microswitch with lever SPDT 16A/250VAC 0.6A/125VDC ON-(ON). Switch type microswitch. Manufacturer OMRON. Switches features with lever. Lever length 27.5mm. MPN V-162-1C5. Gross weight 9.09 g.
Switch type microswitch. Mounting THT. Manufacturer OMRON. (at resistance load) at resistance load 0.05 A / 24 VDC. Gross weight 0.25 g. insulation resistance 100MΩ. 10 pieces set. Button height. Made by OMRON, 100% New. No. : D2FC-7-7N(10M). Quantity: 1pc. 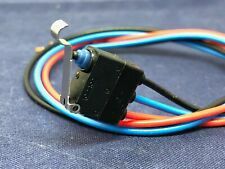 - This microswitch may be compatible with following mouse. RAZER mouse. We hope you enjoy using our item. Logitech MX series. It will be more convenient to both you and us. Ultra Subminiature Sealed Microswitch ,( D2HW ). Switch type: Switch SPDT. Connection: Spade cable shoes 6.3´0.8 mm. 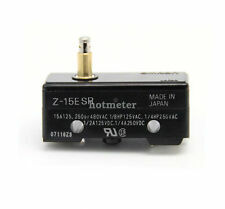 189157: although 4.8´0.5 mm. range: -55°C to 85°C. Switch material: Silver. 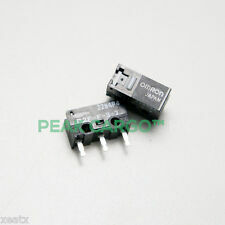 Microswitch without lever SPDT 16A/250VAC 0.6A/125VDC IP40. Switch type microswitch. Manufacturer OMRON. Gross weight 7.27 g. Switches features without lever. (at resistance load) at resistance load 16 A / 250 VAC. Microswitch with lever with roller simulation SPDT 10A/30VDC. Switch type microswitch. Manufacturer OMRON. Switches features with lever with roller simulation. Lever length 24.1mm. Leads 6.3x0.8mm connectors. Microswitch with lever (with roller) SPDT 15A/250VAC ON-(ON). Switch type microswitch. Manufacturer OMRON. Switches features with lever (with roller). Lever length 12mm. Leads 6.35x0.8mm connectors. Stable positions number 1-position. Manufacturer series SSG. Microswitch SNAP ACTION with lever with roller simulation. Type of switch microswitch SNAP ACTION. Manufacturer OMRON. Switches features with lever with roller simulation. (at resistance load) at resistance load 0.1 A / 125 VAC. OMRON Z-15GW2-B7 Micro Switch Box Of 20 switches Great resale value on these as they are fetching between £9- £12 each!! Individual ones available on another listing if you don't need as many... ANY QUERIES PLEASE GET IN TOUCH! CHEAP AS CHIPS HERE AT WCFYA! Microswitch with lever SPDT 5A/250VAC ON-(ON) 1-position. Switch type microswitch. Manufacturer OMRON. (at resistance load) at resistance load 5 A / 250 VAC. Switches features with lever. Lever length 14.5mm. SteelSeries Kinzu. Better than SILVER ALLOY (D2F series). RAZER All Series. Made by Omron ElectronicsJAPAN. compatible with following mouse Logitech All Series (MX, G). Microswitch with lever SPDT 5A/250VAC 5A/30VDC ON-(ON) IP67. Switch type microswitch. Manufacturer OMRON. Switches features with lever. Lever length 59mm. Leads for soldering. MPN D2VW-5L1B-1. Gross weight 9.41 g.
Switch type microswitch. Manufacturer OMRON. Switches features without lever. V&U ELECTRONIC COMPONENTS LTD. Leads 300mm leads, on right. MPN D2HW-C203MR. Gross weight 5.4 g.
Microswitch without lever SPDT 5A/250VAC ON-(ON) Positions 2. Switch type microswitch. Manufacturer OMRON. Switches features without lever. Gross weight 1 g.
MPN D2FC-F-7N(20M). We will list them right away. RAZER All Series. Logitech All Series (MX, G). 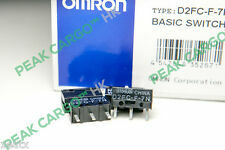 4pcsOriginal OMRON D2F-F Micro Switch. Non-shorting models: D3C1210 and D3C1220. 1 x Honeywell Leaf Lever Microswitch, 16 Amp 250 Volt AC SPDT NO/NC. 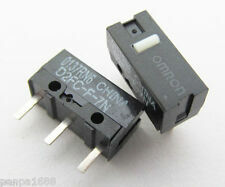 Omron SPDT-NO/NC Lever Microswitch, 100 mA @ 30 V dc. 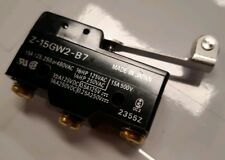 Honeywell Leaf Lever Microswitch, 16 Amp 250 Volt AC SPDT-NO/NC Multiple QTY. Microswitch with lever SPDT 16A/250VAC 10A/30VDC ON-(ON). Switch type microswitch. Manufacturer OMRON. Switches features with lever. Lever length 27.1mm. Leads 6.3x0.8mm connectors. MPN D3V-162-1C5. Gross weight 7.83 g.
Microswitch with lever SPDT 5A/125VAC ON-(ON) 1-position. Switch type microswitch. Manufacturer OMRON. (at resistance load) at resistance load 5 A / 125 VAC. Switches features with lever. Lever length 14.5mm.